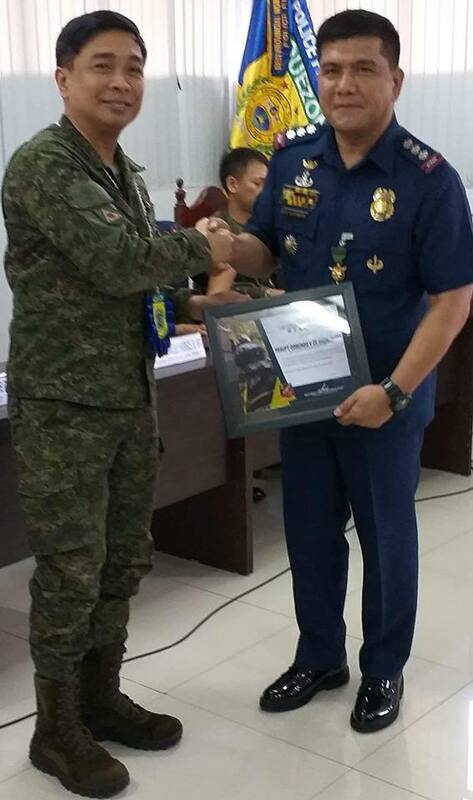 LUCENA CITY - The strong partnership and good working relationship of the military and the police is among the important elements in ensuring the peace, prosperity and development in Quezon province. This was the very essence of the speech delivered by Brig. Gen. Arnulfo Marcelo Burgos, Jr. , commander of the Army’s 202nd Infantry (Unifier) Brigade during his visit on Wednesday at the provincial headquarters of Quezon Police Provincial Office (QPPO). The 202nd Brigade has the operational control over the provinces of Cavite, Laguna, Batangas, Rizal and central Quezon. Burgos made the visit to recognize the efforts and contributions of their police counterparts who have performed well and played significant role in supporting the military in its anti- insurgency campaign in the first and second districts of Quezon. Saying it is their humble gesture of showing their recognition and appreciation to the contributions extended to their command’s internal security mission, Burgos conferred Military Merit medals to five selected police commissioned officers and a non- commissioned officer. They are Senior Supt. Osmundo de Guzman, the Quezon police director, Supt. Von June Nuyda, the deputy police director for operation, Supt. Norman Ranon, chief of the Provincial Intelligence Branch, Supt. Arnulfo Selencio, commander, 1st Quezon Provincial Mobile Force Company, Senior Insp. Liezl Abenilla, deputy chief of Provincial Operations & Plans Branch and SPO2 Mar Matias. In his message, Burgos urged the police officers and their men to maintain the iron clad military- police partnership for the benefit of the public they are serving. “As we conclude today’s ceremony, I call on everyone to continue our close working relationship as we pursue our common goals for the people whom we have sworn to serve. protect and defend”, said Burgos. The Brigade commander said that when he assumed his post last year, one of his priority tasks was to consolidate and solidify the ranks of government security forces, fully knowing that they need to complement and not compete with each other. “After all, we are serving under the same flag, protecting the same country and defending the same people”, he added. Burgos proudly said that for this year alone, the communist guerillas failed to launch any tactical offensive against both government and civilian targets, assuming that this can primarily be attributed to the operations they have been jointly conducting. Such proactive measure against the communist rebels, according to Burgos, has kept them always on the run for fear of being captured or neutralize, causing setbacks and demoralization on their ranks which even resulted to the surrender of eight New People’s Army (NPA) rebels. In Gen. Nakar town in the Northern part of Quezon, the Brigade commander said elements of the newly deployed Infantry Battalion in the isolated village of Umiray were able to recover 13 high- powered firearms and even discovered the rebel groups’ satellite and main training camps as well as their source of Improvised Explosive Device which they used last February against police personnel in Antipolo and Baras in Rizal province. As his parting shot, the young Army general, quoted the words of famous american author Helen Keller: “Alone, we can do so little, together, we can do so much”! A graduate of Philippine Military Academy (PMA) Maringal Class 1988, Burgos is a decorated and respected military officer who completed his various military trainings and post graduate studies here and abroad. He is a recipient of numerous military merit, outstanding achievement medals, distinguished service medals, meritorious achievement medals, commendation medals and certificates of recognition and distinguished service stars.